I’ve been searching the solution for a simple question – how to put several files/folders in a self-extracting package. Well, a long time ago, I’ve found a nice program, called “7-zip SFX Makers” and it seemed to work well, but I’ve found in some cases, the package wasnt being opened on other PCs. Then I’ve forgot that solution and tried many Installer-creator software (like Inno-Setup) and etc… Frankly speaking, I had rarely found a simple program, that could do the simplest task – just put the files in archive, and upon opening, unpack and run the containing exe file. Seems fair simple problem, but seems still tricky for me. 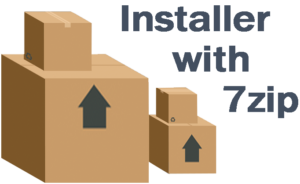 Fortunately, I’ve saw a blog post which described how to build self-extracting package with 7-zip . I’ve added some automation and and got nice Packager. 1) (Note, you need to have 7-zip already installed on your PC). 2) Download SFX-Packager.zip and unpack somewhere. That’s all, you will get the file named _portable_myApplication.exe aside the yourFolder. (The only drawback is that as it’s not officially signed by windows, on first run Windows-Defender will check it for few seconds) and then the program will run well. (p.s. If you need, you can see available SFX commands-list).